Taize--the word is strangely familiar to many throughout the contemporary church. Familiar, perhaps, because the chanted prayers of Taiz are well practiced in churches throughout the world. Strangely, however, because so little is known about Taiz--from its historic beginnings to how the word itself is pronounced. ^^The worship of the Taize community, as it turns out, is best understood in the context of its greater mission. On the day Jason Brian Santos arrived in the Taize community its leader was brutally murdered before his eyes. Instead of making Santos want to leave, the way the community handled this tragedy made him long to stay and learn more about this group of people who could respond to such evil with grace and love. ^^In this book he takes us on a tour of one of the world's first Protestant, ecumenical monastic orders, from its monastic origins in the war-torn south of 1940s France to its emerging mission as a pilgrimage site and spiritual focal point for millions of young people throughout the world. In A Community Called Taize you'll meet the brothers of the order and the countless visitors and volunteers who have taken upon themselves a modest mission: pronouncing peace and reconciliation to the church and the world. - Publisher Jason Brian Santos takes us on a tour of the Taiz? community, one of the world's first ecumenical monastic orders, from its monastic origins in the war-torn south of 1940s France to its emerging mission as a pilgrimage site and spiritual focal point for millions of young people throughout the world. About "A Community Called Taize"
Jason Brian Santos takes us on a tour of the Taiz? community, one of the world's first ecumenical monastic orders, from its monastic origins in the war-torn south of 1940s France to its emerging mission as a pilgrimage site and spiritual focal point for millions of young people throughout the world. Jason Brian Santos arrived at the Taiz community for the first time in 2005. After witnessing the shocking murder of the founder, Santos knew his heart would always be bonded to this unique order. Since then, he's continued to conduct research on the community and speak about its influence in North America. Santos is a Ph.D. candidate at Princeton Theological Seminary in the field of practical theology, studying Christian education, formation and discipleship. 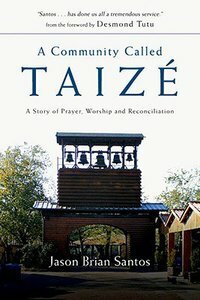 He is the author of A Community Called Taize: A Story of Prayer, Worship and Reconciliation.